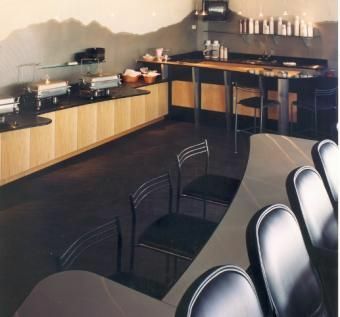 The client wanted a contemporary look and feel for the space their executives would view NASCAR races. The space needed buffet serving areas, bar eating areas, cafe tables, as well as functional kitchen space. We decided to go with sequence matched maple cabinets with two different tops, glass bar tops and 12 gauge stainless steel tops with Ebonized Ash edgeband.